Acknowledged author Jennifer R. Gray PhD RN FAAN wrote Burns & Grove's The Practice of Nursing Research: Appraisal, Synthesis, and Generation of Evidence, 8e comprising 736 pages back in 2016. Textbook and etextbook are published under ISBN 0323377580 and 9780323377584. 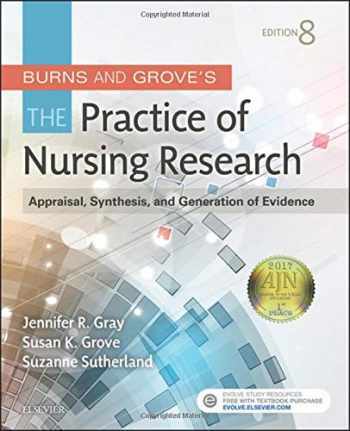 Since then Burns & Grove's The Practice of Nursing Research: Appraisal, Synthesis, and Generation of Evidence, 8e textbook received total rating of 4 stars and was available to sell back to BooksRun online for the top buyback price of $34.09 or rent at the marketplace.